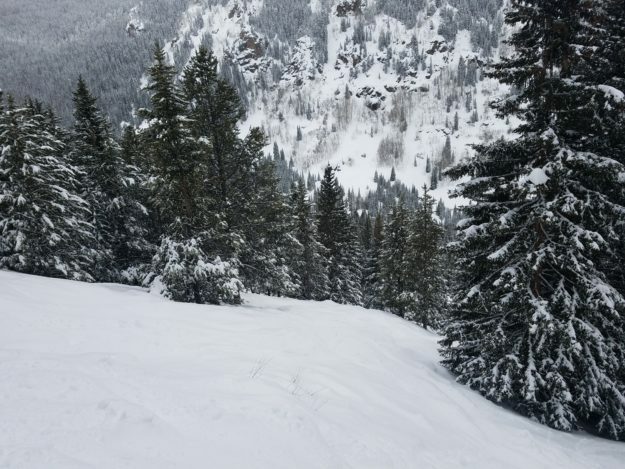 A barely touched stash of powder in Beaver Creek’s Royal Elk Glade on Monday. I spent a couple hours Monday morning in Royal Elk Glade – my favorite part of Beaver Creek. A recent, multi-day storm cycle deposited 27 inches of thick, wet snow in the last three days, but overnight Sunday into Monday temperatures dropped into the 20s and made the snow lighter. It was good and buttery back there, although I purposefully stayed away from the Alta Chutes, which could be dodgy given the weight of the recent snow. No need to get flushed into a terrain trap and go out in a blaze of glory this close to the end of the season – or at any point of the season, for that matter. Royal Elk is accessed through a backcountry gate at the top of the Grouse Mountain Lift, and therefore there’s no snow control or ski patrol. You are on your own in the backcountry, even though the egress connects back to the base of the Grouse Mountain Lift. Steep and heavily timbered, with a west-facing aspect, Royal Elk often stays light and fluffy, although low snow this season made for interesting conditions on gladed tree runs across Colorado. But still very nice to enjoy a powder day in nearly mid-April. Hard to believe less than a week remains before the closings of both Beaver Creek and Vail on Sunday, April 15. Vail Resorts recently announced some closing day lift and time restrictions aimed at reducing the annual mayhem of drunken revelry (see press release below). There may be even more pent-up aggression this season after some historically subpar snow totals. At Beaver Creek, 31 inches of new snow fell in the last week to finally got the resort over the 200-inch mark at 209, but it typically sees well over 300 inches by closing day and that’s not going to happen unless eight feet of snow falls in the next six days. After a warm and dry middle of the week, there is some snow in the forecast for Friday and Saturday … but not eight feet. The massive two- and three-foot dumps just didn’t come this season. That means things should be clearing up by closing day on Sunday, just in time for Spring Back to Vail’s annual World Pond Skimming Championships. There’s free music on Saturday as well, so go to the Spring Back website for all the details. Meanwhile, here’s the info about Vail and Beaver Creek lift closures, followed by another press release about the deadline for renewing your Epic Pass. Enjoy. VAIL, Colo. – April 9, 2018 – Beginning today, Monday, April 9, Beaver Creek Resort will offer skiing and snowboarding terrain in Rose Bowl and trails accessed from Centennial Express Lift (#6), Birds of Prey Lift (#9), and Grouse Mountain Express (#10). Vail Mountain will operate under a special schedule for the final day of the 2017-2018 ski and snowboard season on Sunday, April 15. Spruce Saddle and the Beaver Creek Starbucks will be open for food and beverages through April 15. Private and group lessons will continue to be offered for children and adults through Beaver Creek Ski School through closing day, April 15. Inappropriate behavior that may jeopardize the experience of other guests is not tolerated. As in recent years, violators who are ticketed or arrested will lose skiing and snowboarding privileges for the 2018-2019 season. Those who disobey posted signs and closures or engage in other inappropriate behavior could lose skiing and snowboarding privileges for up to the entire 2018-2019 season. The Epic Pass is the only worldwide unlimited, unrestricted season pass to offer a $49 down payment, with the remainder due in the fall. Sunday, April 15 is the last chance to get the added benefits of 12 discounted lift tickets for family and friends. The Epic Pass features access to 64 mountain resorts in eight countries and 11 states and provinces, including Telluride, Crested Butte, Resorts of the Canadian Rockies and Hakuba Valley, Japan. BROOMFIELD, Colo. – April 9, 2018 – The Epic Pass is the only worldwide unlimited, unrestricted season pass that allows skiers and snowboarders to purchase a season pass next winter at the lowest guaranteed rate with just $49 down now. Purchasing the Epic Pass before Sunday, April 15 also provides skiers and snowboarders with 12 discounted tickets (“Buddy Tickets” and “Ski With a Friend”) to share with friends and family. Priced at $899 for the 2018-19 winter season, the Epic Pass provides access to 64 mountain resorts in eight countries and 11 states and provinces and remains unmatched in the mountain resort industry for the variety and value it offers skiers and snowboarders. There’s never been a better time to be an Epic Pass holder. New for next winter, the Epic Pass will feature access to an additional 19 resorts around the world, including Telluride and Crested Butte Mountain Resort in Colorado; Hakuba Valley’s nine ski resorts in Japan; Resorts of the Canadian Rockies, including Fernie Alpine Resort, Kicking Horse Mountain Resort and Kimberley Alpine Resort in British Columbia, Nakiska in Alberta, Mont Sainte Anne and Stoneham in Quebec; Okemo Mountain Resort in Vermont; and Mount Sunapee Resort in New Hampshire, all in a long-term alliance.